and that space is not counting the email space offered by jubii beta. How much storage do I have in Jubii? We offer the first million beta members 10GB of storage, after this we offer a standard 4 GB. This is a combination of your communication and media storage. nb. jubii is much more than just email (like yahoo/gmail/hotmail/etc.) it's also a storage (like xdrive?) that allow you upload anything to it. any better webspace offer with php+mysql on a reliable host (that do not disappear with your files after few months...) ??? 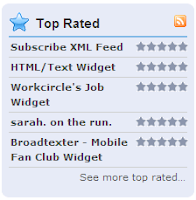 my subscribe XML feed widget follows google search and ultimate website translator widgets to be top rated. this widget lets your readers easily subcribe to your feed with few clicks without confusing them with dozens of icons that most of them only use one or two. tnx for all users and all your inputs to make better widgets. as always, dont forget to try my other widgets. only few days after my google search widget got top rated on widgetbox, now i got my ultimate website translator widget top rated too. this widget allow your readers easily read your web/blog in 18 different languages, in case they're not english native. dont forget to try my other widgets.